I guess this is Squirrel Girl’s time to shine. As much as I love Unbeatable Squirrel Girl, I’m not nearly as big a fan of odd, editorially-mandated cameos. But I am a fan of the very idea of creating a really solid friendship between some of Marvel’s newly prominent female characters. Kate Leth is having a lot of fun with that over in Patsy Walker. A few issues ago, in order to escape the bad guys, Laura attached a tracking device on a squirrel. 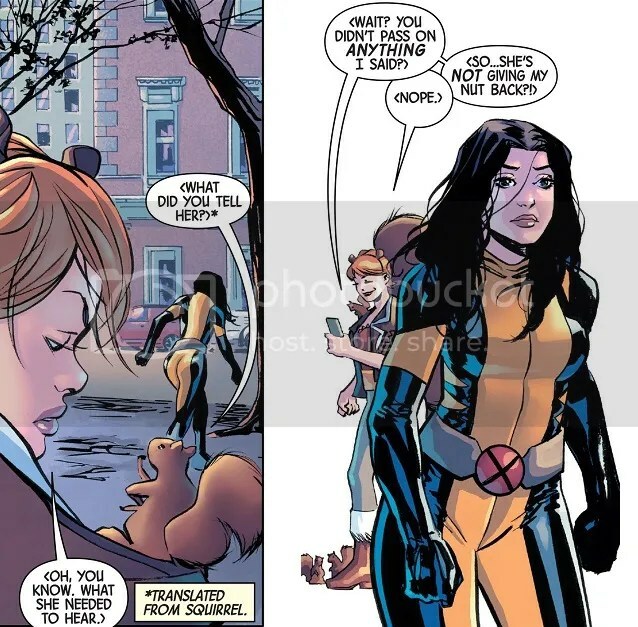 So now Squirrel Girl comes calling, because that squirrel was somebody’s father, and now he’s missing (she also brings along a live wolverine, in case Wolverine can speak to wolverines the way that Squirrel Girl can talk to squirrels). Laura agrees to go with Squirrel Girl to find the missing squirrel, but tells Gabby to stay at home, much to Gabby’s disappointment. Wolverine and Squirrel Girl track down the missing squirrel to a little boy’s room downtown, freeing him from a shoebox. The squirrel is reunited with his family, and Squirrel Girl gives Wolverine a nice pep talk about the importance of family. Laura heads home and apologies to Gabby for leaving her behind. There was a little wonkiness from the general idea of Squirrel Girl showing up at Laura’s front door with a live wolverine. I know Taylor set up that missing squirrel bit in a previous issue, specifically setting up this entire issue. But it’s still a little wonky. Fortunately, Taylor and Takara have a lot of fun with the issue, while mixing in some quality character growth for Wolverine. The two characters work well together, and Taylor acquits himself well in trying to match Ryan North’s humorous take on Squirrel Girl. The story is appropriately silly, and the art is just fantastic. I would be more than happy if Takara wanted to take over as the regular artist on the title. Really good, detailed and comfortable artwork here. Then the emotional story, of Laura coming to terms with having Gabby in her life, ties everything together. This was a solid comic moving the new Wolverine forward, even if it’s weird that Squirrel Girl randomly got her hands on a real, live wolverine. The Zodiac storyline comes to an end, and I couldn’t be happier. This was a dud from Day One. Slott and Camuncoli still make good Spider-Man comics, but even they’re capable of producing mediocre work. 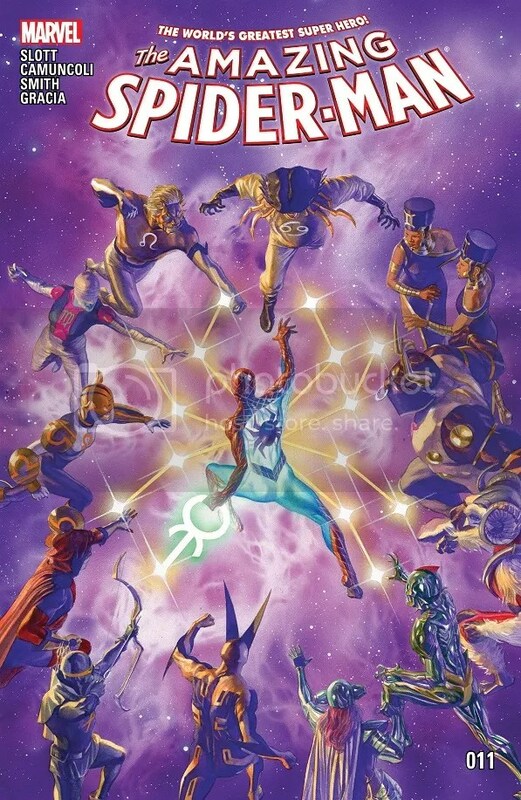 Scorpio’s ascension is at hand, and even as Spidey and his allies rush to stop him, he’s still able to use the Zodiac Key to open a magical doorway. Once inside, he’s given visions of an entire year into the future, knowledge that he plans to use to take over the world. But then Spider-Man shoulder-checks him through the doorway into a white void, then shuts the door behind him. He figures he just shoved Scorpio one year into the future, so now they have a full year to figure out how to stop him. The day is saved, the bad guy is defeated, Spider-Man makes a few quips; this is all standard stuff. But nothing about Scorpio or his new Zodiac stood out as being all that interesting. Honestly, the most exciting part of this issue was at the very end, where Anna Maria suggests that maybe Mockingbird likes Spider-Man. That is some plot and character development I could get behind. I’ve been thinking a lot about why this current Amazing Spider-Man run isn’t nearly as exciting or interesting as Dan Slott’s Superior Spider-Man from a few years back, and I think the answer is Anna Maria. 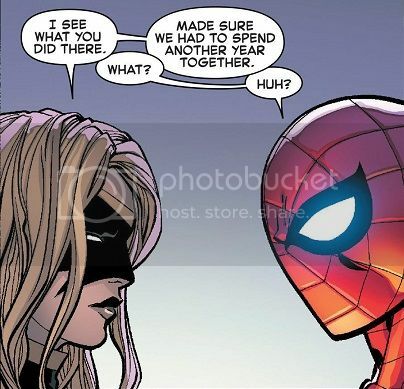 Not only was Superior Spider-Man and all around entertaining comic, Slott introduced a new romance element that has been completely missing for Peter Parker. I was deeply invested in the story of Otto and Anna. That was my favorite part of Superior Spider-Man. But Peter Parker hasn’t had as ingle romantic prospect on the horizon. Peter needs some real personal relationships if this series is ever going to match up to Slott’s best. The great Snyder/Capullo Batman run comes to an end with this issue, in a fitting little farewell story that touches on all the classic Batman elements, while looking fantastic. It’s not exactly ground-breaking stuff, more like a well-earned victory lap. A tremor shakes Gotham City, cutting off the power. Batman is on the case, determined to track down whatever nefarious force has struck his city this time! He checks in with Commissioner Gordon, swings by Arkham Asylum to make sure the inmates are still under wraps, and spies on the Penguin and the Court of Owls to make sure they’re not behind it. He even has a run-in with a former thug, whose last encounter with Batman convinced him to turn his life around. In the end, it turns out the tremor was just a natural quake, and the power comes back on once the power company gets it fixed. Nothing nefarious at all. Still, Batman will keep watch. This may not have been as epic or gripping a comic as the last issue, but this was a fine finale and goodbye. 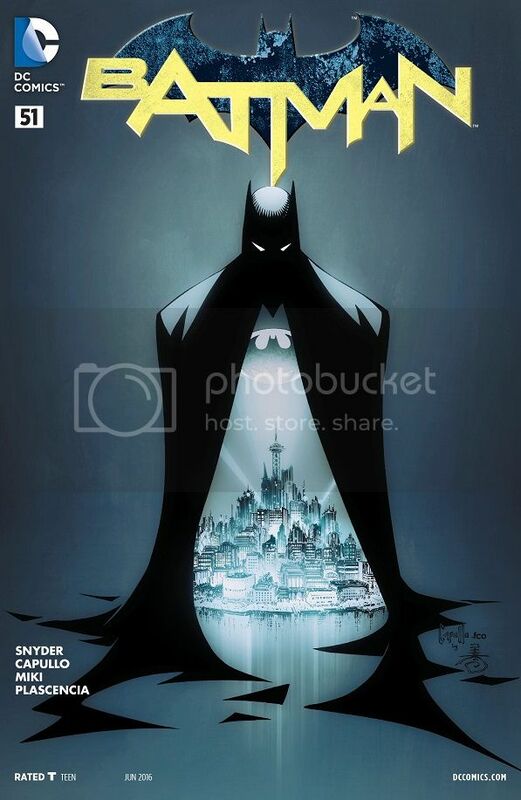 Both of these creators are going to continue with Batman in some capacity, but this 51-issue run was the standard-bearer of the New 52, and their work deserves to be recognized as one of the greats. They had a lot of fun with Batman, and it shows in this issue. They dive right into the head of the hero they’ve been playing with, and send him on a nice tour of Gotham City. The art is great, the writing is fine, the comic is good; it’s all just kind of happy fluff. It is entirely possible that I am missing Snyder’s underlying themes or the exact point he’s trying to make. But I just read a nice Batman comic. A victory lap, a hearty farewell, a smile and nod to all the familiar and enjoyable bits of Batman. I kind of wish we’d gotten a Duke Thomas appearance as Robin, but I’ll live. This was an enjoyable goodbye. The end of all magic is here, and only Doctor Strange can save us! Fortunately, he’s got a whole bunch of magical sidekicks to help him out. Via flashback, we find out that the Lord Imperator of the Empirikul was a Superman-esque figure, whose parents launched him away from their home planet in a rocket. His parents were super scientists, but they lived in a world where science was heretical to the people’s odious magical beliefs. The sorcerers on his planet were going to sacrifice him to Shuma-Gorath (as they did all babies), and his parents sacrificed themselves to get him off-planet. The Imperator has since then dedicated his life to wiping out all magic, and they’ve pretty much succeeded on Earth. Until crazy old Monako shows up and uses a bit of leftover magic to free Doctor Strange and the other magic-users of Earth. He teleports them away to safety, giving up his own life to the Imperator in the process. Once they get their bearings, Strange tells the others that they have to track down every last scrape of magic hiding on Earth, but even that won’t be enough to stop the Empirikul. The Imperator’s origin story is alright. Nothing too fancy or special. For something so alien and awesome as the Empirikul, I was hoping for something really otherworldly. But nah, he’s just an angry kid who loves science and hates magic. Perhaps there is more to uncover. The rest of the issue was fun and entertaining. Monako gets a moment to shine after Aaron spent so much time introducing him earlier in the run. And Doctor Strange really does feel like he’s at the end of his rope. Aaron and Bachalo have crafted a really tense story here, and I’m excited with where it could go next. Brace yourselves, everybody! The craziness is here! I previously poo-pooed the idea that Kamala Khan would be so reckless as to create a bunch of clones of herself, but Wilson reveals what she was going for with that whole idea: pure, unbridled lunacy! Ms. Marvel tries to take on the giant golem version of herself, but she can’t even make a dent. So Bruno builds a giant T-Rex golem to eat all the Kamala clones, but it goes wild. So Bruno summons Loki to help, who leads an army against the clones and the giant and the T-Rex. Basically, everything goes all to flippin’ hell! So Kamala, finally realizing that she’s in way over her had, calls Captain Marvel for help. Carol shows up and stops everything with her awesomeness, then gives Kamala a pep talk about taking time to be herself and be human. She doesn’t have to skip school or her brother’s wedding to be a superhero. Iron Man shows up to check on the mess, and he and Captain Marvel have a couple frosty words (they’re gonna be enemies soon in Civil War II). Carol takes off, and Iron Man reaffirms the earlier pep talk. Kamala feels better about the whole thing, and later gets to attend her brother’s wedding with her family! I definitely like Wilson’s approach to this issue. I’ve thought this golem clone storyline was weird, but it all makes sense now. Wilson is writing the story of how Kamala learns that she is allowed to prioritize her personal live over her superheroics. Wilson has been ramping up the busyness in Kamala’s life for a few issues now, and here, she just throws every crazy thing she can think of into the mix! Clones! Giants! Dinosaurs! Loki! To teach Kamala the right lesson, Wilson threw everything but the kitchen sink at her protagonist. And it was great! Even awkward Iron Man hugs! 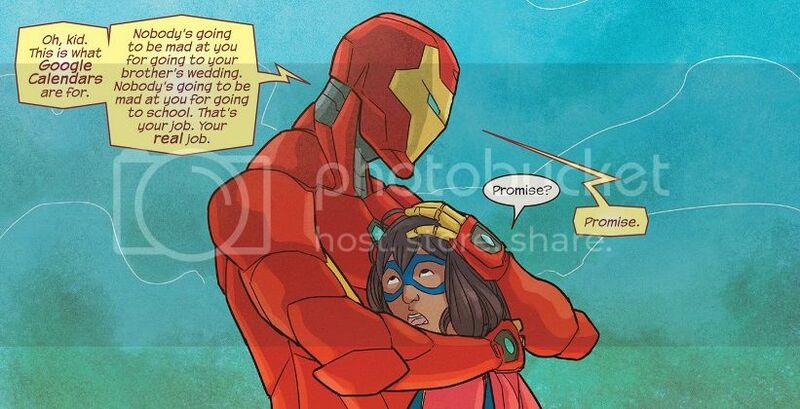 All of that craziness led to some really wonderful scenes between Kamala, Captain Marvel, Iron Man and her family. She learned some very important life lessons, and I’m a sucker for that sort of character development, even when there are also dinosaurs on the page. This was a big issue for Kamala, and Wilson made the absolute most of it! The Casiolena storyline comes to a wonderful end this issue, as Patsy Walker style and humor remain supreme. This series continues to carve out a style unlike anything else in mainstream comics. When they realize Patsy is in trouble (thanks to the ‘Find Me’ app that Ian installed on her phone), She-Hulk, Ian and Tom rush off to save Hellcat and her allies from Casiolena. Along the way, they run into the villain’s army of hipster villains, and convince them that Casiolena is full of it and can’t actually help them with anything. So they just stop wreckin’ stuff. Then all the heroes team up, stop Casiolena with ease, and find out that it was her faithful manservant who betrayed her and alerted Ian on the app. She’s just a bad boss. In the end, Patsy gets an office for her new temp agency! 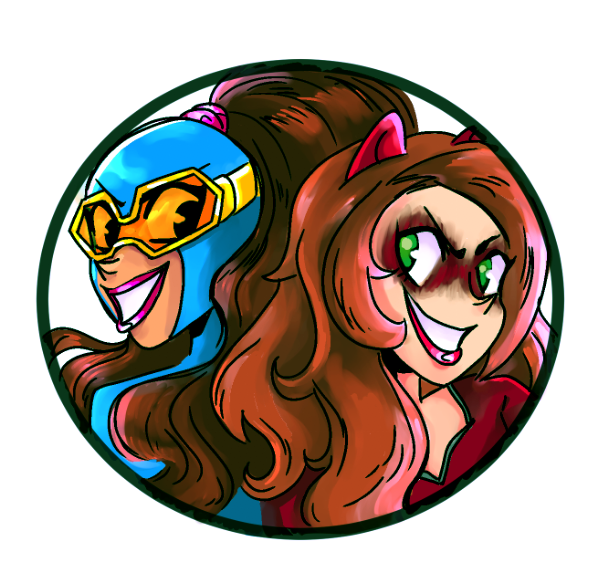 I’m loving this Patsy Walker style. Everything is so colorful and cartoony, but Leth writes a world that’s very down-to-Earth and human. This isn’t just action figures bopping bad guys. These are real people who talk about life and have casual conversations, even when they’re dressed like superheroes and are pummeling the city. 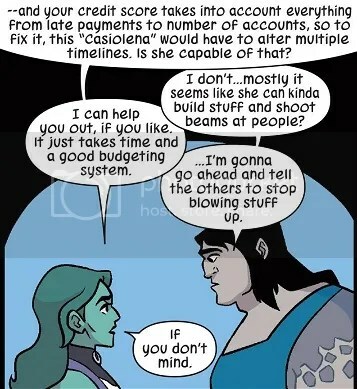 Casiolena promised one of her henchmen that she would magically fix his credit score, but She-Hulk turned him by explaining that a credit score can’t be magically changed, and requires sound budgetary planning. Williams is a perfect companion to Leth’s story. All the characters look so vividly alive and fun, whether they’re super-powered or not. Patsy Walker is a silly, amazing comic that is determined to be its own wonderful little thing. I love that. 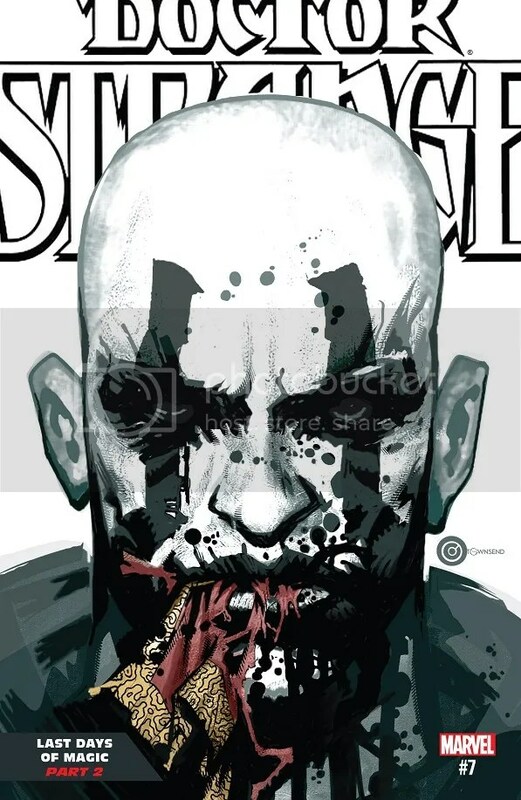 Posted on April 30, 2016, in Batman, Comics, DC, Marvel, Reviews, Spider-Man, X-Men and tagged All-New Wolverine, Amazing Spider-Man, Doctor Strange, Hellcat, Kamala Khan, Ms. Marvel, Patsy Walker, Patsy Walker a.k.a. Hellcat, Squirrel Girl, Wolverine, X-23. Bookmark the permalink. 2 Comments. All-New Wolverine was AMAZING. It is so good! So much fun! I couldn’t stop smiling. From the moment Squirrel Girl showed up, holding a wolverine, and shouting “Wolverine!” this was an absolute delight. I’ve been wanting this team-up since #3, and it was so much better than I even could have hoped. ASM was . . . I don’t know. It’s Slott’s ASM. It’s not particularly strong. Ugh, and now he’s shipping Peter and Bobbi. Bleh. Anna Maria aside, women do not fare well in Slott’s ASM. At least he’s presumably somewhat limited in what he can do with her, while she’s still got her solo. I would hope so, anyway. Dr. Strange was good. I guess it’s nice getting some background on the Empirikul. 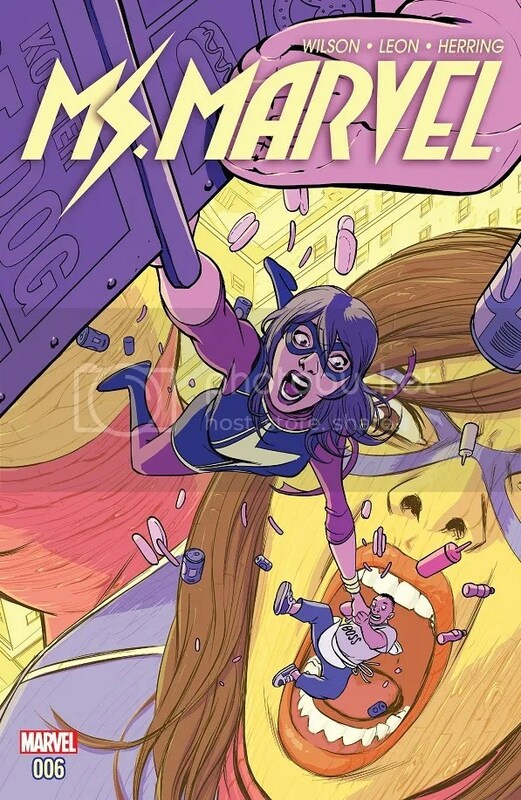 Ms. Marvel was so great. Just getting increasingly ridiculous until it climaxes with The Greatest Splash Page Ever. And then Captain Marvel and Iron Man having a little prelude to Civil War II. And the wedding! Aww! Feels! I also like how this is a book that teaches important lessons. It’s nice. Hellcat was a lot of fun. I’m actually really sympathetic to Casiolena hating being compared to the Enchantress. That would get to be a piss-off. 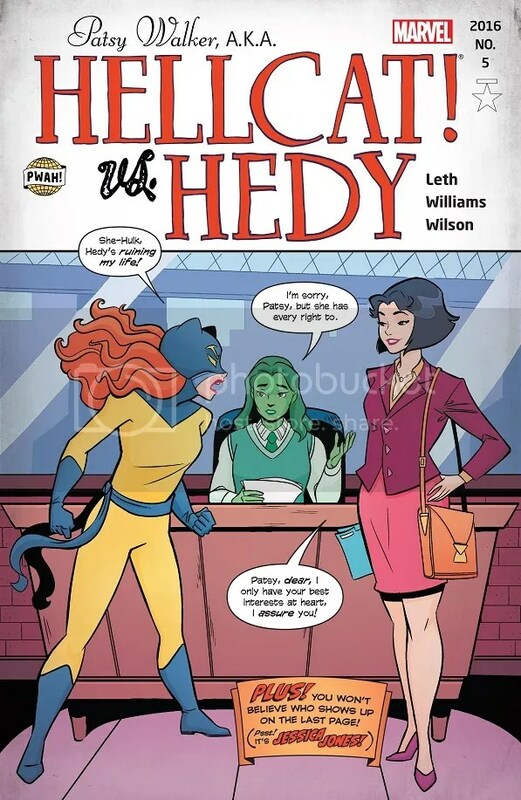 I also like that we get some more hints into why Hedy is trying to screw over Patsy. Squirrel Girl was great, too. As fun as always. The Choose-Your-Own-Adventure aspect was really neat, and done well. And there’s some neat bee facts! Because this book isn’t just fun, it’s also educational! 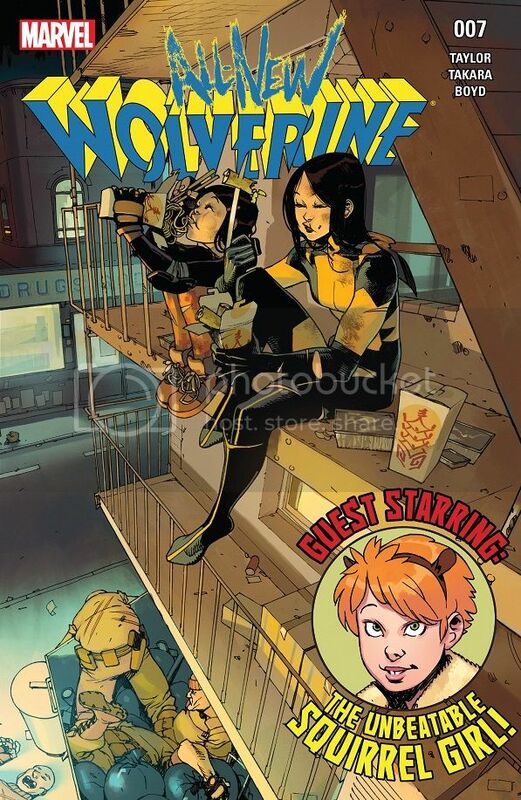 Squirrel Girl vs. Swarm is my idea of a good time, but I was gonna wait to tackle that big insanity of a comic! And yeah, this was just a terrific week for some of my favorite titles. So much good. Not sure what it was about this week, but everything dropped and dropped well!